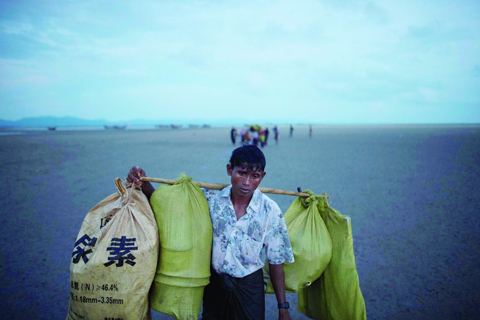 TEKNAF: He trekked to Bangladesh as part of an exodus of a half million people from Myanmar, the largest refugee crisis to hit Asia in decades. But after climbing out of a boat on a creek on Friday, Mohamed Rafiq could go no further. He collapsed onto a muddy spit of land cradling his wife in his lap – a limp figure so exhausted and so hungry she could no longer walk or even raise her wrists. Not all those who have fled over the last few desperate weeks have survived. The International Organization for Migration said more than 60 refugees were confirmed dead or missing and presumed dead after one vessel capsized on rough seas in the area Thursday. The crisis began when a Rohingya insurgent group launched attacks with rifles and machetes on a series of security posts in Myanmar on Aug. 25, prompting the military to launch a brutal round of “clearance operations” in response. Those fleeing have described indiscriminate attacks by security forces and Buddhist mobs, including monks, as well as killings and rapes. While the international community has condemned the violence and called on Myanmar to protect the Rohingya, Sufi Ullah, a police officer in Teknaf, said nothing has changed. “We’re seeing them come across whenever they get the chance,” Ullah said. “They’re hiding themselves in the forests and hills (inside Myanmar) in the daytime. And when they get the chance, they run. The Myanmar army is putting pressure on them. These people are afraid.” Ullah said several thousand new refugees arrived by boat in Bangladesh on Friday, and authorities were not expecting the flow to let up any time soon. On Friday, dramatic scenes played out over and over as hordes of Rohingya who had crossed into Bangladesh overnight tried to make their way further inland. They trudged out of boats and through mud that in some places was knee deep. Men carried babies and old women on their backs. Everyone was exhausted. Sonabanu Chemmon was among those too weak to walk. Her son-in-law had carried her to one of Bangladeshi’s inland creeks, near Shah Porir Dip. But he then abandoned her along with several of her adult daughters. Asked why, Chemmon covered her eyes as tears fell down her cheeks. “He said he had carried me far enough, that he couldn’t carry me anymore,” she said. “He told me, ‘You can make it from here. I have to look after my own children. '”Chemmon was finally helped by several Bangladeshis who are among a small army of local citizenry collecting donations, food and clothing, and handing it out to desperate new arrivals.